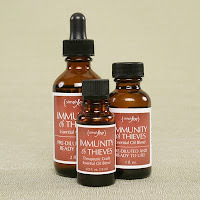 My Immunity of Thieves oil has been flying off the shelves this past month - thanks to word-of-mouth advertising. Someone tells a friend or family member how well the oil worked for them, and soon I'm getting a call for another order. I have found that the majority of the people purchasing my oil are new to essential oils and aromatherapy. Because of this I want to offer some precautions and tips. Essential oils were mankind's first medicine. They have been used for thousands of years, and I'm happy to see so many returning to their use today! Essential oils are very diverse in their effects and can perform many different functions. Synthetic chemicals are completely opposite in that they basically have one action. Essential oils are the volatile liquids distilled from plants. Yes, essential oils are natural, but they are also extremely potent and must be used with care. A few oils can be used neat (undiluted) on the skin. Examples include lavender, sandalwood and tea tree oil. However most essential oils are not suitable for use neat, and can cause irritation. Even the oils mentioned above should only be used diluted if you are not sure how your skin will react to them. Always, always dilute when using them on children. Treat essential oils as medicine and you will be able to enjoy the many benefits they provide. This next section is regarding the Immunity of Thieves oil specifically. If you are purchasing or have purchased my undiluted blend of Immunity of Thieves, the following dilution ratios will be helpful. The safest way to use the oil is by applying it to the bottoms of the feet. The oil is very hot and can cause severe skin sensitivity if used improperly. It must be diluted with a carrier oil (such as olive, sunflower, or almond, etc). Here are a few dilution ratios: (The first number refers to how many parts immunity oil. The second number refers to how many parts carrier oil). This ratio is still extremely concentrated but can be tolerated by most on the bottoms of the feet. This ratio is equal to 25 drops immunity to 1 tsp carrier oil. Mix in an amber glass bottle or clear glass container with lid and store in a dark place. Always keep out of the reach of children. Use enough oil to cover the bottom of each foot. A 10% dilution is still considered quite concentrated and should be used when aggressive results are desired. Most adults can withstand this dilution on other non-sensitive ares of the body such as the chest, neck, and back. This ratio is equal to 10 drops immunity to 1 tsp carrier oil. The adults in my family use this ratio when we have been around someone who has been sick or if we've already come down with something. It keeps us from getting sick in the first place or if already sick, we usually get well within a day or so. This ratio is recommended for use on children, the elderly and those with health concerns. This ratio is equal to 1 drop immunity to 1 tsp carrier oil. Pregnant women shouldn't use more than a 1% dilution of any essential oil and only after consulting a physician. I use the 1:4 ratio on the bottoms of my kids' feet and they do fine with it. Tony and I also use the 1:4 ratio on our skin on occasion. It's warm and tingly but not uncomfortable for us. The bottom line is to take extreme care until you know how much your family's skin can handle. Using more doesn't necessarily mean better results. Many of you have purchased my Ultrasonic Diffuser. This cold-air diffuser is a wonderful tool for putting essential oils into the air. When diffused, essential oils provide air purification by removing metallic particles from the air; increasing atmospheric oxygen; increasing ozone and negative ions in the area, which inhibits bacterial growth; destroying odors from mold, cigarettes, and animals; and filling the air with a fresh, aromatic scent. Another company sells a similar blend using the same oils. They have had their blend tested (hence it's much higher price). Tests have shown that after diffusing the blend of oils for just 12 minutes killed 99.96% of airborne bacteria. I add just 5 or 6 drops of Immunity of Thieves oil to the water in my diffuser. I run it for 12-30 minutes a day. Running it for longer than 30 minutes isn't recommended as it is a strong oil which can irritate mucous membranes if overused. My home does not have an open floor plan, so I move it from room to room as needed to keep my indoor air clean. I have used this little diffuser in larger homes with open floor plans with excellent results! I would say that the diffuser will cover up to a 1000 sq. ft. of open space. If you are interested in purchasing Immunity of Thieves oil or a diffuser, click here to visit my online store! If you have any questions, please contact me! To your health this winter season! PS - Click here to learn more about Immunity of Thieves oil or to find out why it has such peculiar name!